In 1975 Eldred Stebbing retired his famous Zodiac label for pop and rock releases and launched a fresh new label imprint which he called Key. Initial releases were distributed by Pye and then when Pye shut down in New Zealand, via Festival Records (NZ) Ltd. The debut release on the label was the 45 ‘I Get High On Music’, the first single off the second Headband album Rock Garden. In 1976 The Inbetweens (formerly on Impact) and Layton & Trent were signed. The former released an album, the latter just a single. Releases by Zodiac stalwarts Murray Grindlay and Toni Williams followed (although for some reason Toni's releases had Festival branding with Key copyrights). Both released albums for the label. In 1977, with Stebbing’s new producer Rob Aicken and a young engineer Ian Morris, the studio-based label had success with the debut single ‘Gutter Black’ by Ponsonby band Hello Sailor – two band members lived in Jervois Road a few doors away from Stebbing Recording Studios. The single achieved radio play – an almost impossible task for a New Zealand rock band in the mid to late 1970s – partially because their manager, David Gapes, was a co-founder of Radio Hauraki. A successful album by the Hello Sailor followed, and then, in 1978, Ian Morris’s own band Th’ Dudes released their debut album. 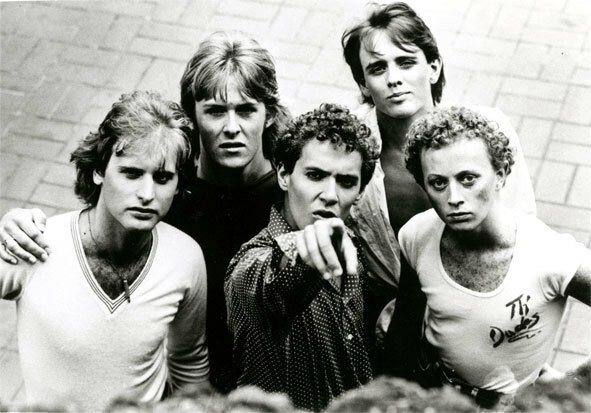 Both albums sold very well in New Zealand with Th’ Dudes certified gold, but more importantly, they launched the careers of several of New Zealand’s key musicians of the 1980s and beyond. Another successful album from each band arrived in 1978 and 1980 respectively but both groups disbanded, leaving Key in the process. Th’ Dudes split prior to their album release. 1978 saw the release of the only album from Golden Harvest, signed to the label when Benny Levin transferred their contract from his Impact label which he was shuttering. The band gave the label two Top 40 singles and a Top 40 (although just for one week) album. The label issued a solitary solo single from Golden Harvest's singer Karl Gordon in 1980, plus singles from Rob Guest (his album was issued on Festival much like Toni Williams but was Key nevertheless), Jacqui Fitzgerald and possibly Yolande Gibson. The Key label’s last release by a new artist was a single by The Royales in 1982, thus effectively ending four decades of Stebbing contemporary record labels. The odd release – country or MOR – would arrive on Zodiac in the 1990s but the grand history of one of New Zealand’s most important labels more or less drew to a close in 1982, with any Stebbing recordings thereafter being licensed to third parties (for example Patsy Riggir who appeared via CBS/Epic in the 1980s).